Tom Stephenson, Eric Fredrick, and Dan Manning (left to right) make up the team that heads the Connected Community Engagement Program. They took part in developing Michigan’s Broadband Roadmap and have helped more than 300 communities across the country create their own Technology Action Plans. 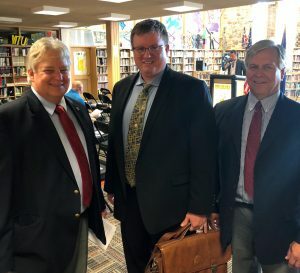 Escanaba, Mich. (August 15, 2018) – Connect Michigan, a subsidiary of the nonprofit Connected Nation, worked with Governor Rick Snyder, his staff, and state technology and business leaders to develop a plan to provide universal access to high-speed internet for every Michigan resident, business, region, and community. 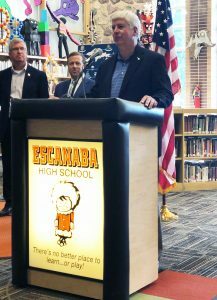 That plan was unveiled today during an event at Escanaba High School. Connect Michigan took part in the Michigan Consortium of Advanced Networks (MCAN), which Gov. Snyder created to help develop a roadmap to guide the state’s goal of ubiquitous broadband access. MCAN gathered input from both public and private entities and held six listening tours with Michiganders before creating the comprehensive plan. Connect Michigan has worked with community and county leaders across Michigan for eight years—developing community Technology Action Plans, providing technical assistance, and supporting the ubiquitous access and adoption of broadband. Connect Michigan’s staff not only works and lives in the Great Lakes State but is dedicated to fulfilling Connected Nation’s mission to improve lives by providing innovative solutions that expand the access, adoption, and use of high-speed (broadband) internet and its related technologies to all people. Gov. Rick Snyder (R-Mich.) unveils the Michigan Broadband Roadmap at Escanaba High School in Escanaba, Michigan. Michigan currently ranks 30th in the nation for broadband availability, and more than 380,000 households, in mostly rural areas, do not have access to vital high-speed internet service. Another 2 million households only have access to a single, terrestrial internet service provider. There is approximately $2.5 billion in potential economic opportunities available among these unserved households if this gap is closed. The broadband roadmap identifies three main areas for improvement: 1) Access to Unserved Areas; 2) Increase Broadband Adoption; and 3) Advance Michigan’s Broadband Ecosystem. Recommendations include a call for greater investment in broadband to improve community and economic development, establishing a single point of contact within state government, promoting and building awareness for low-cost broadband subscription programs, improving the workforce pool for the telecommunications industry, promoting digital literacy, and creating a permanent broadband commission to advise future governors and the legislature. To learn more about Connect Michigan, visit us at www.connectednation.org/Michigan. About Connected Nation: Our mission is to improve lives by providing innovative solutions that expand access, adoption, and use of broadband (high-speed internet) and its related technologies to all people. Everyone belongs in a Connected Nation. Connect Michigan is a local subsidiary of CN with staff working and living in Michigan.